The Samsung Galaxy M20 has been finally launched in India and will go on sale on February 5th via Amazon. We are comparing this mid-range device with the Xiaomi Redmi Note 6 Pro to see which device would be the right buy for you in terms of specifications. 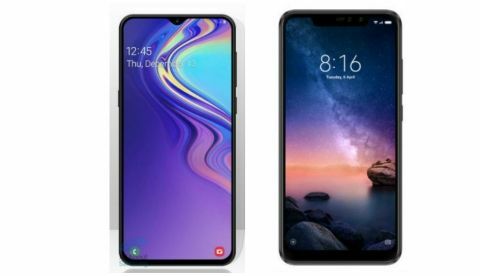 Recently, Samsung has launched two new smartphones in India Galaxy M10 and M20. The company is focusing on targeting Millennials with their two new budget devices. However, Xiaomi has built a great market in India when it comes to budget segment smartphones. Xiaomi’s Redmi series is quite popular among people because of the kind of hardware they offer to customers at a reasonable price. 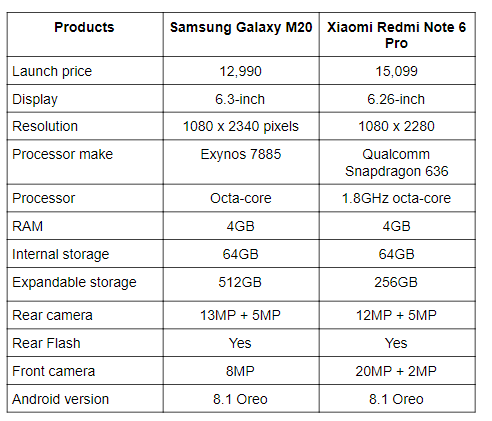 It would be interesting to see whether the Samsung latest smartphone “Galaxy M20” would able to give a tough competition to the Xiaomi Note 6 Pro? At least on paper. Let's begin with the display of these two smartphones. The Samsung Galaxy M20 features a 6.3-inch FHD+ display that offers a resolution of 2340 x 1080 pixels. The phone has a water-drop notch on top of the display, which gives you more viewing area. On the other hand, the Xiaomi Redmi Note 6 Pro sports a slightly smaller 6.26-inch display that comes with a resolution of 1080 x 2280 pixels. The phone sports a traditional notch on top of it, which houses the dual front camera and a mic. When it comes to the processor, the Samsung equipped its latest device with its own Exynos 7885 octa-core processor, which is coupled with 4GB RAM and 64GB internal memory. On the other side, the Xiaomi Redmi Note 6 Pro is backed by a Qualcomm Snapdragon 660 processor, which is clocked at 1.8GHz. As far as the cameras are concerned, the USP of the Xiaomi Redmi Note 6 Pro is its dual camera setup on both front and back. The phone has a dual 12MP + 5MP rear cameras with a dual 20MP + 2MP camera setup on the front. Coming to the Samsung Galaxy M20, the phone has a dual 13MP + 5MP camera setup on the back. The 5MP sensor can be used for clicking wide angle shots. On the front, it has an 8MP sensor. The Xiaomi Redmi Note 6 Pro is now available in India at a price of Rs 14,699. Those who are interested to buy the Samsung Galaxy M20, have to wait till February 5.